Deadpool possesses a superhuman healing factor derived from that of the mutant Wolverine that allows him to regenerate damaged or destroyed areas of his cellular structure at a rate far greater than that of an ordinary human. As such, he can regrow severed limbs or vital organs. The speed at which this healing factor works varies in direct proportion to the severity of the damage Deadpool suffers. This healing factor also affords Deadpool a virtual immunity to poisons and most drugs, as well as an enhanced resistance to diseases and an extended life span. Unlike Wolverine’s natural healing factor, Deadpool’s is mentally driven to a partial extent. Due to the presence of this superhuman healing ability, many of Deadpool’s natural physical attributes have been enhanced. Deadpool’s musculature generates considerably less fatigue toxins than the muscles of an ordinary human being, granting him superhuman levels of stamina in all physical activities. His natural strength, agility and reflexes have been enhanced to levels that are beyond the natural limits of the human body. Deadpool’s agility and reaction time are superior to those of even the finest human athlete. Deadpool employs any number of weapons depending on his current assignment. Most often he will utilize a combination of guns and blades. 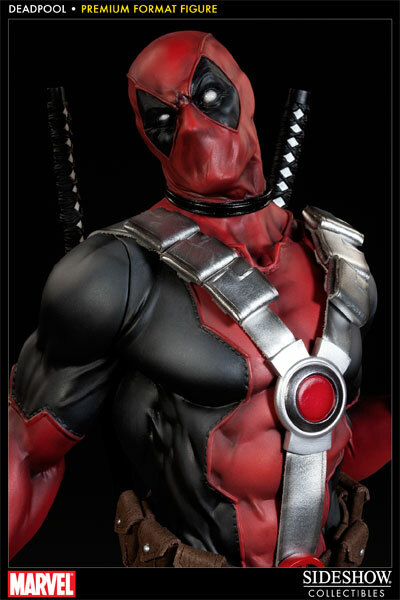 Deadpool utilizes a teleportation device located in his belt to whisk him out of (and occasionally into) danger, as well as a holographic image inducer that he can use to disguise his true appearance as necessary.